BitFenix send over an e-mail to announce the launch of new color options and custom front panels for its Micro-ITX Prodigy case. From now on, the case will be available in "Fire Red" and "Atomic Orange", and users will be able to buy custom front panels. Since the release of our award-winning Prodigy and the taste of different color versions of Prodigy displayed at Computex 2012, users have chimed in through forums and social media on which colors they love to have. Today, BitFenix is proud to announce the release of the Prodigy in both Fire Red and Atomic Orange. 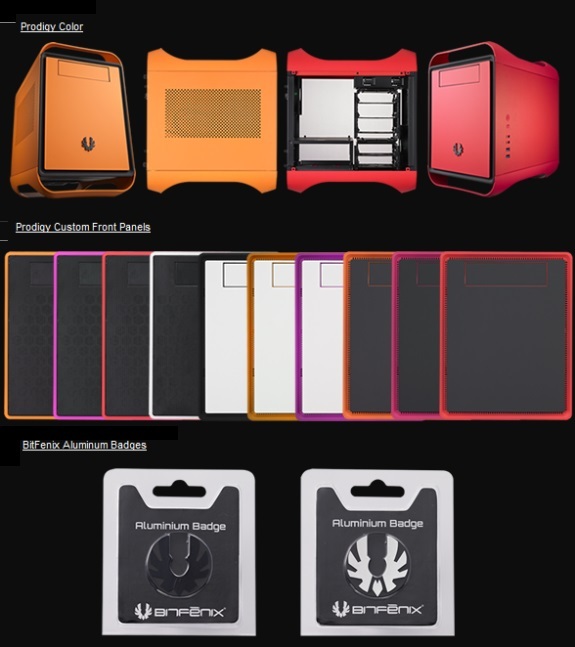 In addition, BitFenix is introducing a large range of Custom Front Panel and Aluminum Badge accessories, enabling BitFenix fans to customize their Prodigy to their heart's content. Fire Red and Atomic Orange Prodigy bring a new flavor to the highly regarded mITX case. Winning multiple awards all around the globe, the compact housing is suspended by colored handles made with BitFenix FyberFlex™ Composite for easy portability and maximum shock absorption. On the inside, the new colors maintain our modular FlexCage™ gives you the same flexibility to install up to five 3.5" hard disks or 2.5" SSDs, or remove it entirely to fit up to 240mm watercooling radiators and long graphics cards. For added flexibility, additional SSD locations are also included, and with interchangeable front facades mean Prodigy will suit your individual style. With tool-free convenience, two USB 3.0 ports, filtered intakes, and proprietary BitFenix SofTouch™ Surface Treatment, Prodigy is the compact case with no compromises. In the addition to helping you customize your Prodigy to match your style and components, the BitFenix Prodigy Custom Front Panel does just that. Choosing between black or white, stylish SofTouch™ finish, or high airflow filtered mesh, the Prodigy Custom Front Panels are designed easily to swap and snap in place and enables users to personalize and color coordinate their system with a touch of color. For some added flair, BitFenix now offers Aluminum Badges in both black and silver. These anodized aluminum badges are the perfect accent to a monster build. Complete with adhesive backing, these are easy to apply and look fantastic as well. Prodigy owners looking for custom front panels can now also choose their preferred badge color to compliment their build. BitFenix Prodigy Fire Red and Atomic Orange carry an MSRP of 69€ in the EU (incl. 19% VAT), $79 in North America. Prodigy Custom Front Panels will be priced at 14.90€ in the EU (incl. 19% VAT), $19.99 in North America. BitFenix Aluminum Badges will have an MSRP at 2.90€ in the EU (incl. 19% VAT), $3.99 in North America. All of these new items will be available in store shelves around the end of November.